New Scratch world map 2018 ! Mymap chocolate edition! This scratch off map we used the best technology of printing, selective varnish, bronze paint, foil stamping. Brown interiors will appeal to every admirer of the minimalist, modern design and high-tech ideas. In the corners you will find enlarge maps of the Europe and Asia ! Also You can mark the best cities ( places) for coffee and chocolate lovers! Every country under the scratch layer - a bright saturated colors, with the capitals and largest cities! On the map and scratch layer you can see the sights and main countries -producers of coffee and chocolate and Sea ways of their transportation. 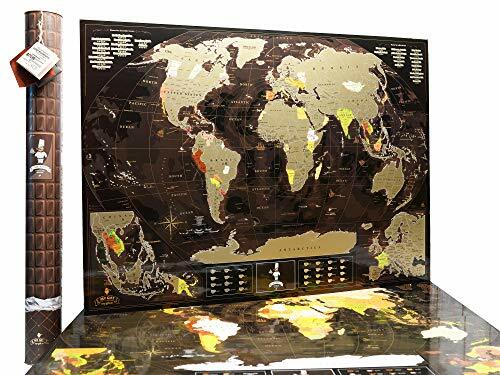 MyMap chocolate Edition – Large, high quality scratchable map of the World! This Map belongs to the «luxury» segment and made from the best and eco materials. Scratch World Map is perfect gift for any occasion that will impress the whole family. After all, how exciting to gather the whole family to erase the country and to think where to go next time. Inside the box with gifts, it has everything you need for markers. To erase the layer and clean the remains of scratching, you can use a coin and scrap of felt, they are there. Also inside you can find greeting card in which you can write your short wish. SCRATCH OFF MAP FOR CHOCOLATE & COFFEE LOVERS! - With our map you will finally be able to spot and mark the destinations you've already visited and prepare the future trips you've been looking forward to. Available in large 35'' x 25'' dimensions, this scratch off map will impress with the high-quality and eco materials that have been used. PRESERVE YOUR PRECIOUS MEMORIES! - Grab a coin, scratch off the first layer and reveal another piece of your life and your journeys. Every time you go on a new destination, learn about a new culture, taste exotic founds, be sure to come back home and mark it on your scratch-off map! DISCOVER THE BEST COFFEE & CHOCOLATE PLACES! - Our scratch off map is designed to let you mark the best cities and places for coffee and chocolate in the world! On the map and scratch layer you can see the sights and main countries - producers of coffee and chocolate and the sea ways of their transportation! Under the scratch layer, you'll find every country with their capitals and largest cities in bright saturated colors! LIVEN UP THAT BORING WALL & ENHANCE YOUR GEOGRAPHY KNOWLEDGE: This scratch-off world map is far more than a beautiful and elegant way to decorate that empty wall in your house...It is also an excellent opportunity to brush up your geography knowledge, while relishing your favorite adventures and trips with friends and family!